Chicago, IL -- Much has changed about the Chicago Sharks, a team entering its second season as a franchise. One thing has not - their stingy defense. Opening the new season at home in front of their fans, the Sharks clamped down on the visiting Utah Jazz, holding them to just 39% shooting from the field (29-73), and took home the 91-78 victory in the 2017-18 NBA regular season curtain raiser. Of course, a team cannot merely play defense as points are still needed, and the Sharks were led on that end by none other than the former Jazz All-Star Gordon Hayward himself. Hayward, who opted to leave the Jazz for a four year, $114.47 million deal with the Sharks in the offseason, led all scorers with 20 points along with 4 rebounds, 7 assists, and 3 steals in 35 minutes played in his Chicago debut. He was not the lone debutant who made his presence felt, as fellow new signee Derrick Rose, a Chicago native, added 16 points and 8 assists on 6 of 11 shooting in his homecoming. Patty Mills added 11 points and 7 assists from the bench, while rookie Josh Jackson intrigued, not only with his 7 points and 5 rebounds on a very efficient 3 of 4 shooting from the field, but with his lockdown defense that caused Utah’s new signee - and Hayward’s replacement - Otto Porter Jr. to finish with just 3 points on 1 of 14 shooting (1-10 from three). It wasn’t all doom and gloom for the Jazz, however, as Rodney Hood led the way for the with 20 points, while Dante Exum set a new career high of 17 assists alongside 5 points and 3 rebounds. Nonetheless, Utah was unable to find any flow in this game, despite outscoring Chicago 28-18 in the third quarter following a 14-6 run, as the Sharks would quickly regain control of proceedings early in the fourth, and most of the 19 points Utah would score in the final period were a product of garbage time. The Sharks will now travel to Houston to take on the Rockets tomorrow evening in a back-to-back, their first of three in the opening month of the new season. Re: [S2] Chicago Sharks - Season Opener! Jazz fans must be pretty annoyed. Good start to the new era. Definitely a strong start. Much better than Hayward's real 2018 season debut. 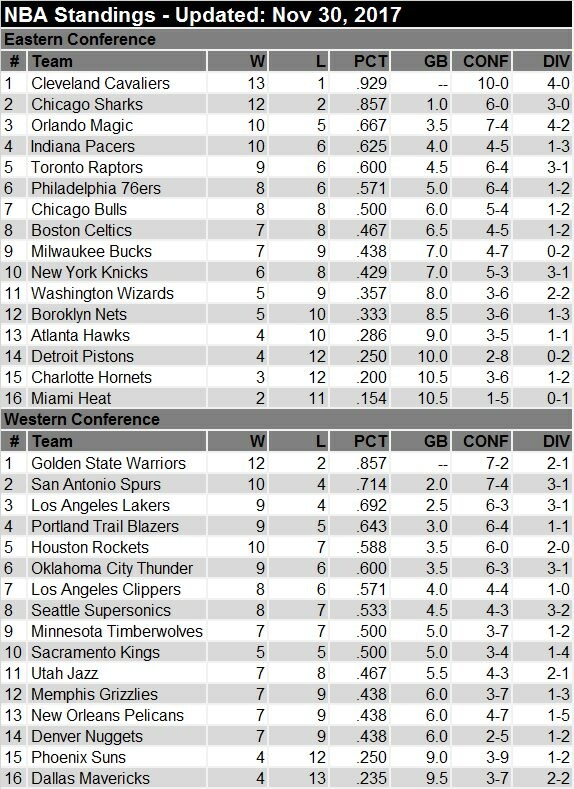 Phil89 wrote: Jazz fans must be pretty annoyed. Andrew wrote: Definitely a strong start. Much better than Hayward's real 2018 season debut. 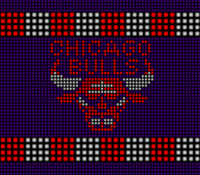 Chicago, IL -- With the exception of the teams’ final exchange in the 2016-17 season, the Bulls-Sharks crosstown matchup were some of the closest and hotly contested games last season, with the Sharks taking home the bragging rights after winning the season series 3-1. With that knowledge in mind, fans would have expected this first meeting to be a close affair as well, with Fred Hoiberg’s Bulls wanting to take revenge and reasserting themselves as the number one team in Chicago. The Sharks had other ideas. 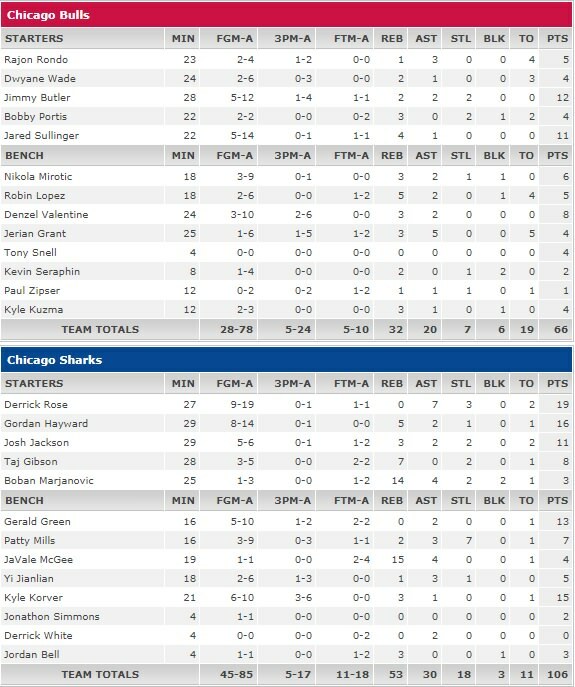 Led by Derrick Rose’s 19 point, 7 assist, and 3 steals, as well as a stingy ball-hawking defense that came away with a staggering 18 steals on the night, the Chicago Sharks easily dismantled the visiting Bulls 106-66, winning the first Windy City Derby of the 2017-18 season and extending their win streak to 3 games in a row. 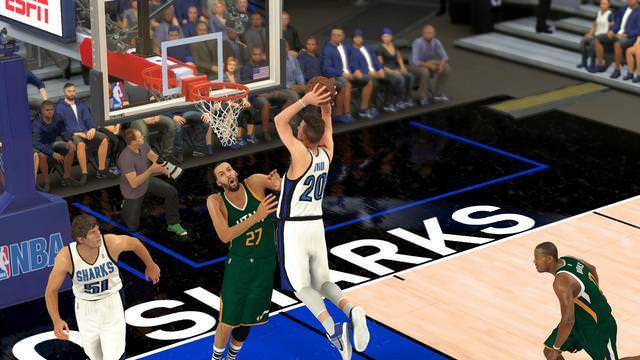 Gordon Hayward chipped in with 16 points and 5 rebounds, while the bench mob of Kyle Korver, Gerald Green, and Patty Mills combined for 35 of the 49 bench points the Sharks had in this one. Mills also led the way with a career high 7 steals, which is also a new Sharks franchise record. 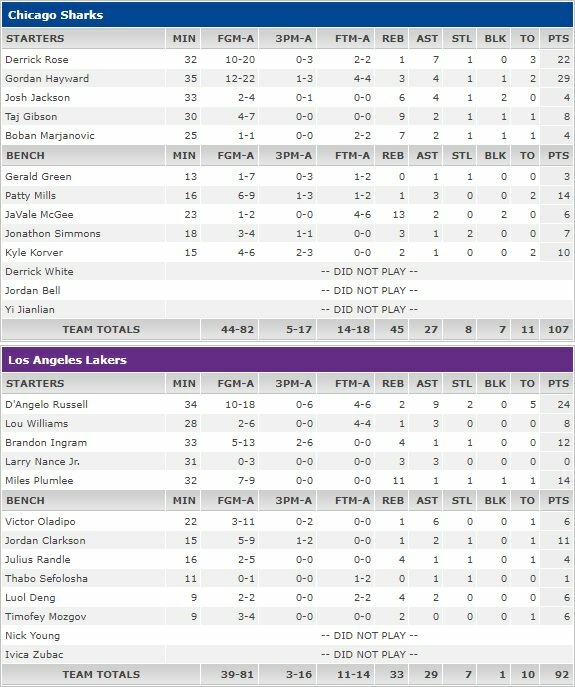 In comparison, the entire Bulls team only had 7 steals on the evening. Bulls star man Jimmy Butler led the team in scoring with just 12 points, and was one of only two players to reach double figures for the visitors, with Jared Sullinger finishing the night with 11 points and 4 rebounds. It was a night of struggles for the Bulls, as the team made just 28 of their 78 attempts from the field, went 5 of 24 from deep and only converted 50% (5-10) from the free throw line. 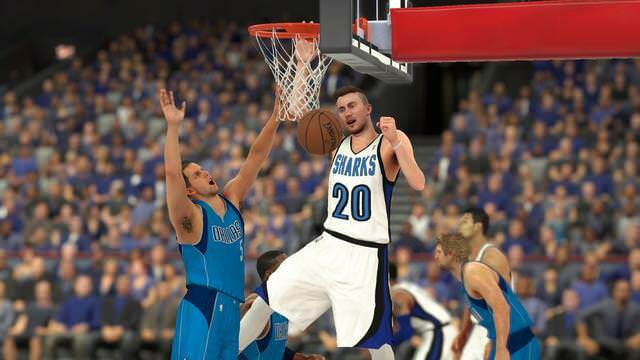 The visitors also struggled on the glass, as the Sharks outrebounded them by a staggering margin of 53-32. The Bulls did not have a single player who grabbed more than 5 rebounds (Robin Lopez with 5 leads the team). In comparison, the Sharks center duo of JaVale McGee and Boban Marjanovic combined for 29 rebounds alone for the hosts. “I’m very happy with the way we played tonight, obviously the fans all want a win in these rivalry games and I’m glad we were able to send them home happy.” said Sharks coach David Blatt. The Sharks (3-0) will now prepare for a back to back home stand against the visiting Detroit Pistons and the Dallas Mavericks in two days time. Re: [S2] Chicago Sharks - Chicago Derby! I like how your roster is basically the All-Leo's favorites team. Bet they're fun to use! What a difference one summer can make. 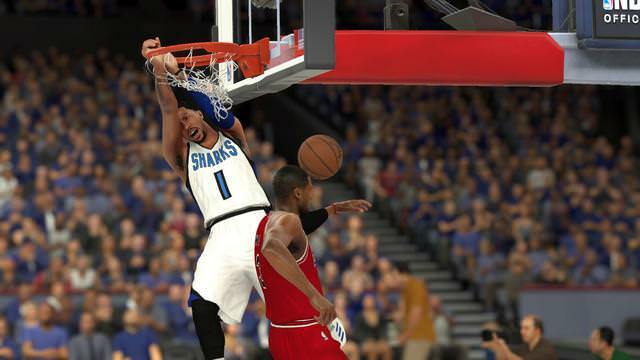 After a massive roster overhaul that saw the additions of Gordon Hayward, Derrick Rose, Josh Jackson and others, everybody expected the Chicago Sharks to improve upon a somewhat positive, but still mediocre inaugural campaign from last season. However, I think we can safely assume that nobody - not even the Sharks front office - could have imagined they would be this good. Riding on adrenaline, the Sharks came out firing on all cylinders to begin the 2017-18 season, winning their first 5 games before dropping their first game away at the Golden State against the defending champions. They would then go on to win 7 of the 8 remaining games of November and closed out the month on a 4 game winning streak and a 12-2 record, which ties the Warriors for the second-best record in the league (behind Cleveland). So how have they done it so far? Here are our five takeaways from the month of November for the Chicago Sharks. The NBA’s Most Improved Player and first time All-Star last season, Gordon Hayward turned down a contract offer to remain with the Utah Jazz in the summer, opting instead to join a new project in Chicago with the 33-49 Sharks, and has not looked back since. In the first 14 games of his Sharks career thus far, Hayward has averaged a career high 23.3 points per game on a career high 50% shooting from the field and 34.5% from deep, while playing just 31.7 minutes per game compared to last season’s 35.0. Hayward’s consistency and efficient scoring is a massive reason as to how the offensively challenged Sharks have morphed into the 5th best offensive team in the league. Anchored by Boban Marjanovic in the middle, the Chicago Sharks already had a very solid defense last season, and in fact it was because of their defense that they were able to conjure up a very respectable 33 wins in the franchise’s inaugural season. However, they have elevated that defense to a whole new level, taking it from very solid to tops in the league, and it’s down to two main additions in the offseason - drafting rookie Josh Jackson, and hiring Ron Adams to be assistant head coach under David Blatt. The former lead assistant to Steve Kerr in Golden State and previously, Tom Thibodeau with the Chicago Bulls, Ron Adams is known around the league as a defensive guru and the Sharks area already reaping the rewards of having him on Blatt’s staff. Chicago was always good at generating turnovers, and Adams has made a point to shape the defensive scheme around those strengths, upping the team’s steals per game from 9.3 to a league leading 10.6 per, resulting in that ridiculous figure of 15.5 points off turnover per game, and just 81.7 field goal attempts allowed (42.4% oFG%, 4th best), which again leads the league. Of course, these types of numbers cannot be done without a special defensive talent being on the floor, and that man happens to be rookie Josh Jackson, who the Sharks picked second overall in the draft. Tasked with guarding the opposing team’s best player every night, the rookie has not shied away from the challenge, allowing just 5.8 points per game on a team-best 31.3% oFG%, and is also third on the team in steals (1.4). Defense might not win rookie of the year awards, but it wins championships and Jackson looks to be all in on that side of the floor. His defense isn’t the only positive trait that he brings to the team either. Seen before the draft as being instable and somewhat of an enigma with an erratic jumper on the offensive end of the floor, Jackson has so far shattered those perceptions by accepting his role as the 4th option on the floor. He has shown fantastic patience and exhibited great shot selections, making his mark only in transition and on wide open looks, letting others create the chances for him in the half court. As a result, Jackson is shooting 61.2% from the field and 42.9% from deep, an improvement on his college rate of 54.9% and 37.8%, respectively. While those numbers will die down and he’ll eventually hit that rookie wall, as all rookies do, these mental attributes are a positive sign moving forward. Many people had raised eyebrows when news broke of the Sharks giving Derrick Rose a $69.94 million for three years in the summer, but looking back on it now, they might have gotten a steal. Looking as healthy and explosive as he has ever been, Rose has produced his best averages since the 2011-12 season, is considerably more efficient than he was during his lone season in New York last year; and is even comfortable enough to throw down dunks on the break and in traffic so far this season, which is something that he almost actively avoided doing after his various knee injuries the past few seasons. He may not be the MVP Rose anymore, and he may not ever return to those heights, but if he could stay healthy – and he did last season - and continue producing at this clip as the floor general and complement scorer to Gordon Hayward, the Sharks might just be able to not only get to the playoffs but make some noise when they get there. One of the biggest weaknesses of the Sharks last season was that there was no true deep threat on the team, with Patty Mills being one of only three players to shoot over 35% from three. In fact, the team was last in the league in three point shooting, taking and making the least at a woeful clip of just 31.3%. This season saw the addition of actual shooters in the form of Gordon Hayward and career sharpshooter Kyle Korver, who has transformed the team’s offense completely. With the space opened up from their willingness to shoot the long ball, driving lanes are opened up for players like Derrick Rose, which in turn opens up shots for everybody else on the floor. As a result, Chicago is shooting the long ball at a rate of 34.4% from deep as a whole, good enough for 17th in the NBA and an increase of 3.1% from last season. If you ask most Sharks fans, they’ll probably point to the 40 point drubbing of cross-town rival Bulls just 2 days after the Rockets game, but objectively speaking, winning by 30 points over a Houston Rockets team that won 51 games last season is no small feat. Chicago clamped down on defense on a very good Rockets offense, and held them to just 36% shooting (33/90) from the field and 20% from deep (6/29). Eric Gordon in particular had a rough night, going 3 for 13 from the floor for just 9 points. There wasn’t a whole lot of defeats to choose from, but losing to Golden State was almost unavoidable and totally understandable. Giving up 34 points in the fourth quarter and losing to a Deron Williams-led Clippers team is not. Williams may have had a resurgence last season after winning sixth man of the year with the Sonics, but it doesn’t excuse the defensive minded Sharks from letting the Clippers look like Chris Paul never left. Pose for the camera, Gordon! Last edited by Valor on Sat Apr 14, 2018 8:27 pm, edited 1 time in total. The NBA is back! After months of inaction followed by a flurry of offseason dealings, NBA basketball is finally back in action, and it has truly lived up to the hype so far. Between being intrigued by promising rookies getting on the floor for the first time in NBA uniforms, and being wowed by how well (and not well) some of the splashy offseason transactions have gone thus far, there have been plenty of captivating storylines to follow. However, here at Race to the MVP, we obviously will focus on only the best of the best, and even with all the noise and activity around the league, this bunch of elites just continues to produce year after year; and that is why, they deserve to be mentioned among the greats of the game. Comment: After winning his first league MVP award last season, Westbrook continues right from where he has left off, as he once again looks to be the first player since Oscar Robertson to average a triple double in a season (he missed that mark by 0.5 rpg last season). 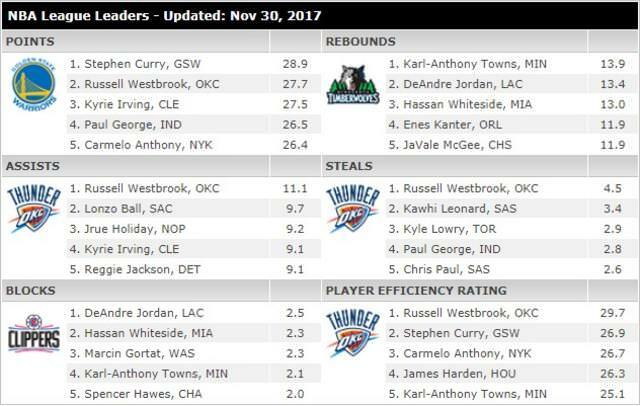 It’s not just any triple double averages he’s chasing either, as Russ is currently leading the league in both assists and steals, and is second behind Steph Curry in scoring. Historic stuff. Comment: Yes he has Kevin Durant and Klay Thompson and Draymond Green and all those other great players on his team, but that doesn’t take away from how good Steph Curry continues to be year after year, as the two time regular season MVP and newly crowned Finals MVP begins the Warriors title defense campaign in style, leading the league in scoring and shattering his own career best marks in both field goal percentage and three point percentage. Comment: This is going to sound crazy, and we can already see the stack of hate mail coming in from LeBron fans who will say we have lost our damn minds here at Race to the MVP, but the fact of the matter is, Kyrie Irving is having a better season than his future HOF teammate right now. He has improved his scoring (+2.5) and playmaking (+1.9) even more from last season, is clearly the engine that drives the Cavs forward in games, and is Cleveland’s closer at the end of games. This is not just a fluke month, and Kyrie is only going to become more and more important to the Cavs as the season progresses. Comment: Averaging career highs in four of the five major statistical categories, Paul George has made a statement of intent in his 8th NBA season thus far that he’s taking that next step towards superstar status, and the Pacers are looking like Eastern Conference Contenders as a result of his brilliance. Comment: No, your eyes do not deceive you. D’Angelo Russell, the guy that once got into trouble secretly filming his teammate in a private conversation before leaking it, is the 5th most valuable player in the NBA after the first month of the 2017-18 NBA season. The Lakers surprised a lot of people last season after sneaking into the playoffs with a 40-42 record, but that is nothing compared to what has happened so far this season, as LA is sitting pretty at 3rd place in the Western Conference behind Golden State and San Antonio with a record of 9-4, and it’s largely thanks to a career year from Russell. While it’ is unlikely that he’ll win MVP honors (never say never though! ), he’ll definitely be one of the favourites for Most Improved Player this year if he keeps this up. Comment: Could this be the year that LeBron finally slows down? Of course, it might just be your average mini slump, but so far in season 15, Lebron has recorded his lowest scoring average since his rookie season, his overall stats have taken a dip from last year, and his turnovers are a career high rate of 4.0 at the moment. Still, LeBron on the decline is better than most of the league, and that’s why he continues to feature in the MVP race year after year. Comment: There’s no mistaking that Stephen Curry is the MVP of the Golden State Warriors, but that doesn’t take away from the importance of Kevin Durant to the defending champions. He may not be averaging 32 points per game like he did when he won the MVP in 2014 for OKC, but his efficiency is still there, and the mere presence of a 7 foot scoring machine who can play guard if he wanted/needed to makes life a lot easier for his teammates. Comment: Kawhi is actually struggling a little bit on the offensive end as the Spurs attempt to adjust on the fly with the addition of Free Agent acquisition Chris Paul into the lineup, but make no mistake, this isn’t a down year for Kawhi, as he is averaging ridiculous career highs thus far on the defensive end of the floor, contributing a ridiculous 3.4 steals and 1.7 blocks per game and allowing just 10.2 points per game on 36% shooting from his opponents. Now that’s a proper two-way player. Comment: The Sharks made a lot of moves this offseason, and getting Gordon Hayward to come over from the Jazz may have been the most important move of them all, as last season’s first time All-Star and Most Improved Player is averaging a career high 23.3 points per game on 50% shooting from the field and his lowest minutes per game average in 5 seasons. Chicago has surprised a lot of people with their dominant first month of basketball and Hayward is the biggest driving force behind their success. Comment: Lillard was angry being left off the All-NBA first and second team last season (he made third team) after making the second team in 2016, and has vowed to come back with a vengeance. So far, he has done just that, putting up a career high in scoring while maintaining the increased assist totals from last season and is also the most efficient he has ever been in his career. Portland is currently in the 4th spot in the West and if Lillard can keep producing like this consistency, watch out for those Blazers. Lamrock wrote: I like how your roster is basically the All-Leo's favorites team. Bet they're fun to use! Definitely a lot more fun using players I like! Re: [S2] Chicago Sharks - November Recap! It's nice to see someone update a thread since I've been active again. Did the playoffs rejuvenate your interest? Nice month. I have a lot of catching up to do on this thread. You have a lot of fun players on your roster; pretty much a collection of budget beasts, though I see you paid a pretty penny to get Rose compared to nowadays. It's good to see he's living up to that. Vintage Rose indeed! Great recaps. cavs4872 wrote: It's nice to see someone update a thread since I've been active again. Did the playoffs rejuvenate your interest? Andrew wrote: Vintage Rose indeed! Great recaps. Cheers Andrew! Rose is fantastic in the game, but I think I do have to sit him out of back to backs or something 'cause there is the high injury risk factor with the knee, so we'll see. Cleveland, OH -- Sharks rookie Josh Jackson stood there in disbelief as the final buzzer sounded, unable to comprehend what had just occurred. The Sharks had rallied back from a deficit that was as large as 16 at one point in the first half to finally tie the game up at 99 apiece with 2 minutes remaining behind the efforts of Gordon Hayward (37 points, 7 rebounds), and Derrick Rose (14 points, 10 assists), and looks to have all the momentum as they looked to close the game out and leapfrog Cleveland for the number one spot in the Eastern Conference. All of a sudden, Kyrie Irving happened. Not that he wasn’t killing them the entire game already, but he had been relatively quiet in the since Sharks head coach David Blatt made the call to switch the 6-8 Jackson – their best defender – onto Kyrie in the second half, and it looked like it was working. Irving has just 4 points in the second half after scoring 27 in the first and Cleveland had been outscored 30-19 thus far in the final period. Then came the onslaught. Free Throw, Free Throw, Jumper, Deep Three, Jumper. Before the Sharks could react, Kyrie Irving had gone on a solo 9-0 run and closed the game out for the Cleveland Cavaliers. Irving finished with a game high 40 points, along with (also a game high) 12 assists and 3 steals on 16 of 30 shooting in 40 minutes of play. 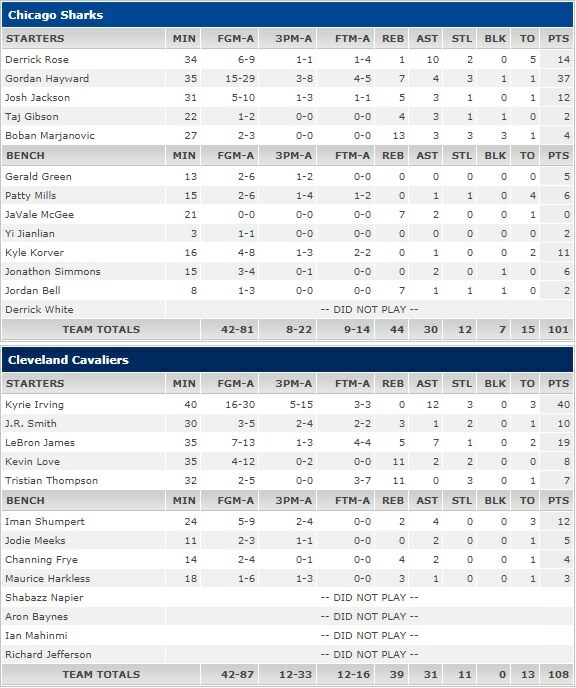 Lebron James added 19 points, 5 rebounds, and 7 assists while Iman Shumpert chipped in with 12 points off the bench. But it was all Kyrie down the stretch. The Sharks now fall to 13-3 and will look to bounce back with a victory at home against the Los Angles on Wednesday night. A pedestrian night for LeBron, at least. Great effort to rally, shame Kyrie happened. Great to see Rose fit and firing and the Hayward signing paying off big time. Tough loss against the Cavs. Looks like you need your big men and bench guys to contribute a bit more on the offensive end. 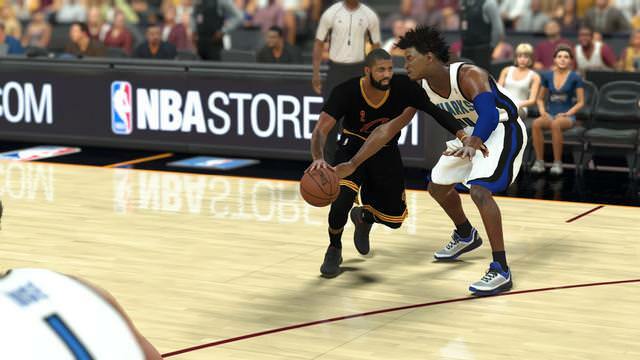 I'm not sure I've ever played a game in 2K vs. the Cavs where LeBron led the team in shot attempts. They can't seem to get his tendencies right. Andrew wrote: A pedestrian night for LeBron, at least. Great effort to rally, shame Kyrie happened. Yeah Kyrie was unstoppable, usually Jackson helps me shut down perimeter scorers but even after i switched him on Kyrie after he torched Rose he still killed me. Yeah it's been a fantastic start, didn't see this coming tbh. At least I thought it was going to take more time to get it going. 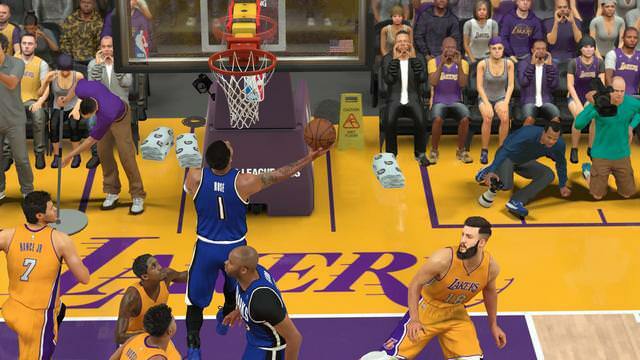 My big guys just arent that good at scoring outside of dunking. Marjanovic is terrible catching/holding onto the ball in traffic and has limited post moves. Gibson's hit or miss, McGee has no post game whatsoever and I don't like abusing pick and roll for dunks so yeah...it is what it is for now. Bench definitely needs to step up, Patty Mills shooting 18% from deep isn't helping. 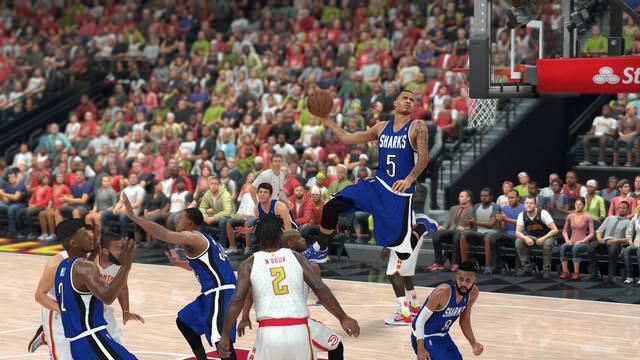 Lamrock wrote: I'm not sure I've ever played a game in 2K vs. the Cavs where LeBron led the team in shot attempts. They can't seem to get his tendencies right. 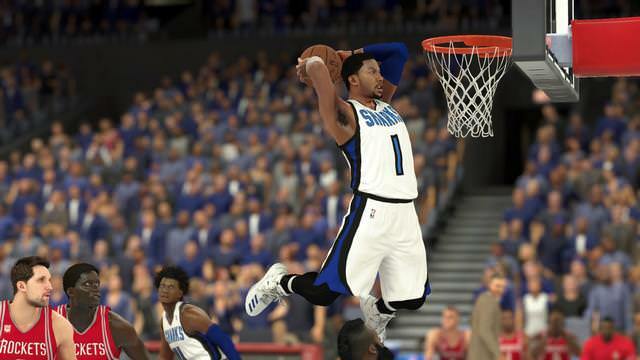 Definitely very passive both in game and in sim, his scoring average is always in the low 20s for the season. Los Angeles, CA -- After shocking the reigning champion Golden State Warriors with a 17 point blowout victory the previous game, the rising stars of the Western Conference came into this game with their confidence brimming, ready to take on the rising stars of the Eastern Conference: The Chicago Sharks. It was a game that many in and around the league were very excited about, and it definitely lived up to the hype. 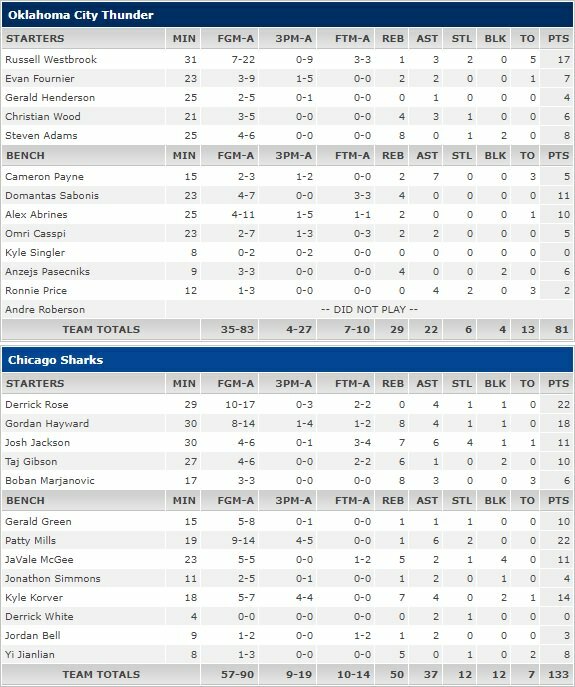 After going back and forth with runs from both teams resulting in a 1-2 point affair throughout, the Chicago Sharks rallied behind their veteran duo of Gordon Hayward and Derrick Rose, who combined for 30 of the Sharks’ 34 fourth quarter points to edge out the Lakers’ 18 in the period, and come away with a hard earned 107-92 victory at Staples Center. Hayward finished with 29 points on 12-22 shooting while Rose had 22 points and 7 assists on 10-20 shooting. With Hayward and Rose’s offensive explosion coming late in the ball game, the Sharks bench played a massive role in keeping them in the ball game, as Mills (14), Korver (10), Jonathon Simmons (7) and JaVale McGee (6 points, 13 rebounds) all providing valuable contributions throughout. The Lakers were led by breakout star D’Angelo Russell, who, like every other scoring point guard this season, had his way with the Sharks’ defence, leading the way with a team high 24 points and 9 assists on a very efficient 10-18 from the field despite missing all 6 of his three point attempts. Miles Plumlee started the game on fire with 10 points on a perfect 5-5 shooting, but managed just 4 more points after that as the Sharks brought on JaVale McGee to offset the speed advantage that Plumlee had over Marjanovic. Chicago now improve to 19-4 on the season and see their win streak extended to 6 while the Lakers drop to 15-9, snapping their two game win streak. Rose still enjoying being back in his hometown. 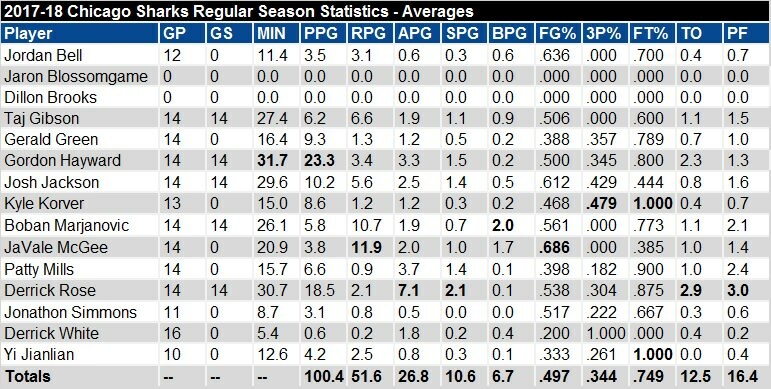 Hayward must be a lock for all-star on current form. How about Rose? Andrew wrote: Rose still enjoying being back in his hometown. Chicago, IL -- The Chicago Sharks continued their unbelievably hot start to the season on Tuesday night when they annihilated the reigning MVP and his team by a historic margin for both parties involved. Hosting the reigning MVP Russell Westbrook and the Oklahoma City Thunder at Chicago Stadium in the Boxing Day spectacle, the Sharks dominated from start to finish, never trailing at any point in the ball game and ended the affair with the biggest win in franchise history – a winning margin of 52 points (133-81) – while also handing the Thunder with their biggest defeat ever (previously 42 point loss to Minnesota in the 2008-09 season). Spurred by their suffocating defense, Chicago got off to a quick start, putting up 43 points in the first quarter alone on 19-26 shooting from the field (4-7 from deep) while just allowing 19 points on 35% shooting from the visiting Thunder. The hot start would continue in the second period where they continued shooting over 70% from the field, mostly on fast breaks created by blocked shots and generated turnovers, ending the half with a commanding 75-35 lead. 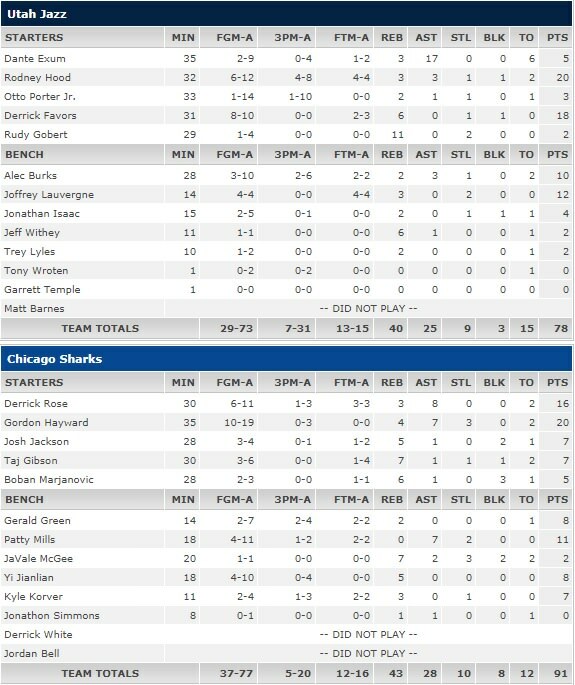 Chicago ended the contest with 8 players in double figures, led by their point guards Derrick Rose and Patty Mills, who led the game with 22 points apiece; Gordan Hayward’s 18 points and 8 rebounds; and also Kyle Korver’s 14 points and 7 rebounds on 5-7 shooting (4-4 from three). 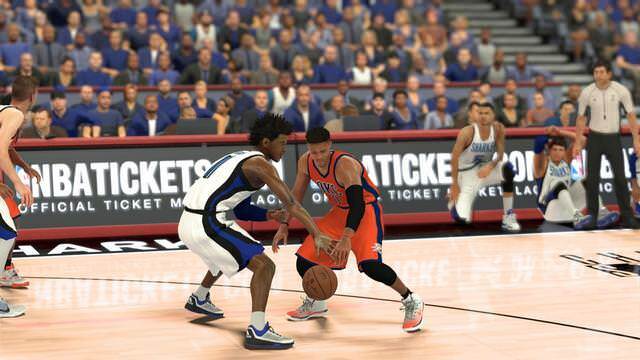 However, the real star of the show was rookie forward Josh Jackson, who in addition to contributing a well-balanced stat line of 11 points, 7 rebounds, 6 assists and 4 steals on 4-6 shooting from the field, was also the primary defender on the reigning MVP Russell Westbrook, shutting down the explosive point guard and limiting him to just 17 points and 3 assists on 7-22 shooting with a game high 5 turnovers, essentially announcing himself as a premier defender in the NBA. To put things in perspective, Westbrook’s season averages coming into this game was at 24.2 points, 9.1 rebounds, 10.8 assists, and 3.9 steals per game on 48.7% shooting, and he is widely considered to be one of the most athletic point guards in NBA history. Chicago have now won 9 of their last 10 games and will look to improve upon their very impressive record of 22-5 on Thursday evening against the Philadelphia 76ers.